The co-ordinated visits took place at 2:00pm throughout the region to mark the contribution made by Independent Custody Visitors (ICVs) as part of National Volunteers’ Week. Police and Crime Commissioner, Peter McCall said: “I am really pleased that we have been able to highlight the work of our ICVs as part of National Volunteers’ Week. 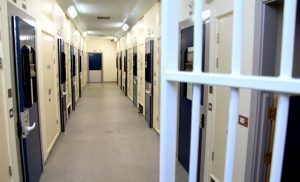 “All of the visitors are volunteers who give up their own time to make unannounced visits to our police custody suites every week at all times of day and night. I am so grateful and would like to thank the ICVs for all their hard work and dedication as volunteers. Every volunteer is a superb example to us all that we can all have a role in helping to keep our communities safe, they are special people selflessly giving their time to help others. The four Panel Chairs (Barrow, Kendal, Carlisle and Workington), said: “We always offer to visit and interview every person detained at the time of our visit, and a large majority of detainees do take up the offer. The Cumbria Independent Custody Visiting Scheme is administered by the Office of the Police and Crime Commissioner and operated in consultation with the Chief Constable. The scheme aims to ensure that two visitors make an unannounced visit to all four designated custody suites every week of the year. In addition, visitors inspect the facilities at other police stations whenever the cells are in use to detain people who have been arrested. Cumbria currently has forty-four Independent Custody Visitors. Two visitors from each of the four panels make weekly unannounced inspections of the four designated Custody Suites at Barrow, Carlisle, Kendal and Workington. The Cumbria Independent Custody Visiting Scheme works in close co-operation with the schemes operated by the other five Police and Crime Commissioners throughout the North West of England and North Wales, to ensure that the needs of people detained in custody are met through independent checks on their safety and well-being. The four Cumbria ICV panels have occasional vacancies for new members. Anyone who is interested in becoming an ICV can get more information from the Police and Crime Commissioner’s website at https://cumbria-pcc.gov.uk/what-we-do/custody-visiting/ or calling the Scheme Administrator on 01768 217734.